Approximately 55,000 new cases of pancreatic cancer are diagnosed in the U.S. each year, some of which are caused by a gene mutation that can be passed from generation to generation.1 Pancreatic cancer is associated with multiple hereditary cancer syndromes. Because of this, it is important to know your complete cancer family history and evaluate which hereditary cancer syndrome may be the cause. When pancreatic cancer is the predominant cancer in a family, the most common known hereditary causes are mutations in the PALB2, BRCA2 and p16 genes. You have a personal or family history of pancreatic cancer and melanoma. You have two or more close blood relatives** with pancreatic cancer. 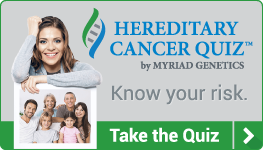 To help you assess whether you may be benefit from hereditary cancer genetic testing, you can take the Myriad Hereditary Cancer Quiz. This quiz can help you get the information you need to discuss your risk of cancer with your healthcare professional and ask for further evaluation. Targeted screening and surveillance for pancreatic cancer. Improved compliance with tailored screening recommendations and preventive measures. Improved outcomes through prevention, earlier diagnosis and treatment of specific cancers, including breast, ovarian and melanoma. Counseling for those who carry the mutation and their family members on the underlying cause of the cancer. **Close blood relative refers to first- or second-degree relatives. First-degree relatives include parents, siblings, and children. Second-degree relatives include grandparents, aunts/uncles and nieces/nephews.